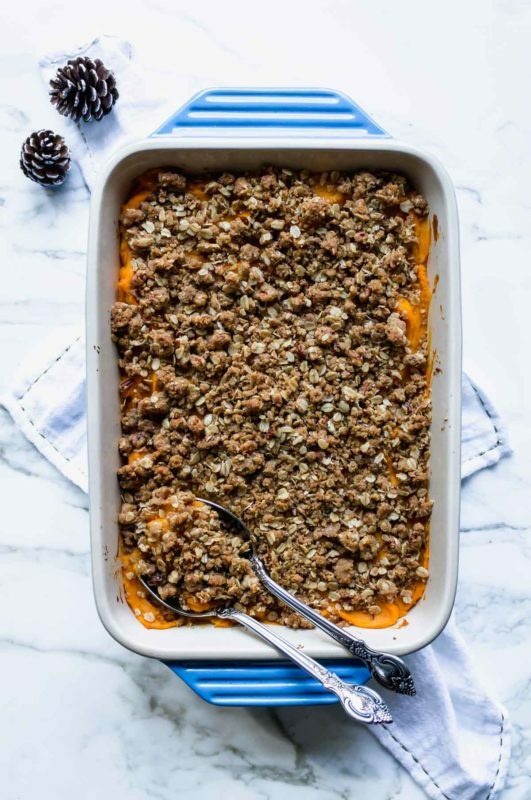 A lightened-up version of the classic Southern side dish, this sweet potato casserole features super smooth mashed sweet potatoes with a brown sugar pecan oat crumble on top. No marshmallows here. If you had told me 10 years ago that I’d be posting a recipe with sweet potatoes as the star, I’d have laughed you out of the room. I’m not proud of this admission, but I was a card-carrying sweet potato hater for the first two decades of my life. I just didn’t enjoy them. I think it had something to do with the fact that I expected potatoes to be savory, in the same way I expect pickles to be savory, and it just didn’t compute that they should be sweet. 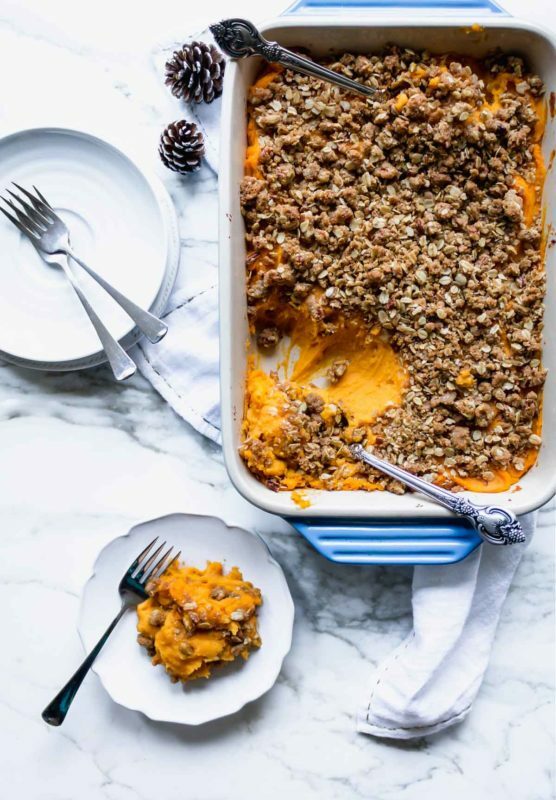 I avoided sweet potato casserole and all other forms of the spud at Thanksgiving like the plague, and obviously the rest of the time too, which was easier to do then than it would be now. Sweet potatoes are all the rage now! I can pinpoint the time at which this aversion reversed itself forever: Thanksgiving 2010. I was living in New York City, freshly graduated from college. I took the train home to Philadelphia for Thanksgiving, even though I had to take it right back the next day because I hadn’t accrued enough vacation time to take Friday off. I was a little beaten down by the big city, and coming home was exactly what I needed. We went to a restaurant my parents love for Thanksgiving dinner (I realize that’s strange, but there were just 4 of us), and it was there that I took a small portion of the mashed sweet potatoes on offer because my dad (southern by birth, of course) insisted they were good. 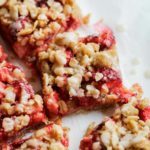 I took a small bite, expecting the cloying, gross sweetness I remembered from whatever childhood experience I’d had. But I was shocked when instead, I encountered silky, buttery, barely-sweet complexity. The texture was just…beyond. They were ethereally smooth. Silky really is the best description. And they really weren’t all that sweet! After my first bite, I immediately got up and went back for a hearty portion. And then another. And then I had it for dessert, instead of pie. Yes, a new obsession was born that day. I think my parents were shocked at the extent of the turnaround. I’ll admit I was just as surprised. When I got back to the city, I took to having baked sweet potatoes for dinner and seeking them out on menus. It was serious and it really hasn’t waned since then (though now I eat more than just a sweet potato for dinner). Eventually, I developed a recipe as close as I could get to those original, extremely smooth, subtly sweet potatoes. The secret to achieving the best texture is to use an immersion blender to purée the potatoes once they are boiled, rather than using a masher or a hand mixer. 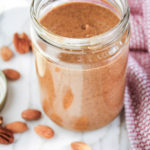 If you don’t have an immersion blender, I would also recommend a food processor. I think a normal blender would get overheated by trying to blend the thick mixture, but you could try it. Immersion blenders are fairly cheap though, and great to make soups and smoothies as well. This is the one I use. 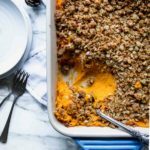 I often make just the mashed sweet potatoes to accompany meats and vegetables. I can never eat enough of it. 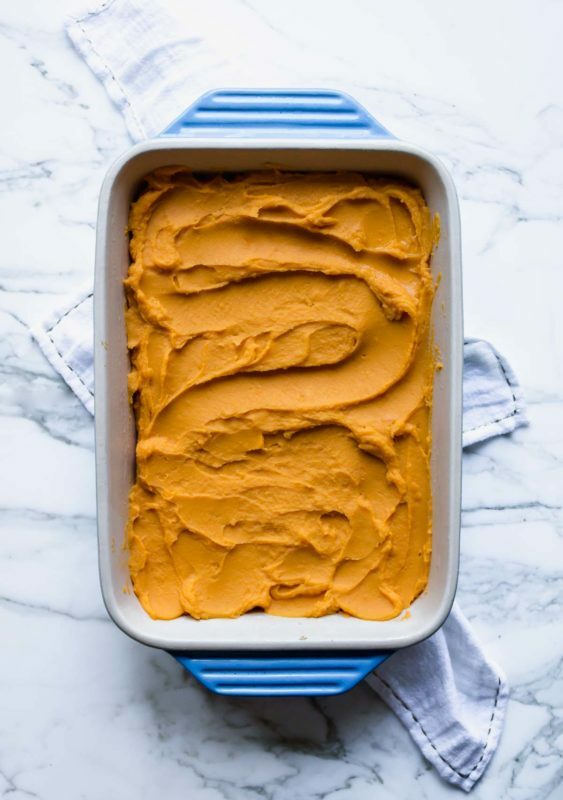 The smooth texture and natural flavor of the sweet potatoes, enhanced with just a bare amount of butter and maple syrup, simply cannot be beat. But this year, I thought I’d use my recipe to remake a traditional Thanksgiving side: sweet potato casserole. It will not be cloyingly sweet. We will not be using eggs or condensed milk. We will certainly not be using marshmallows. No, this is even better. No – this sweet potato casserole focuses on the stars themselves, and everything else is just enhancement. 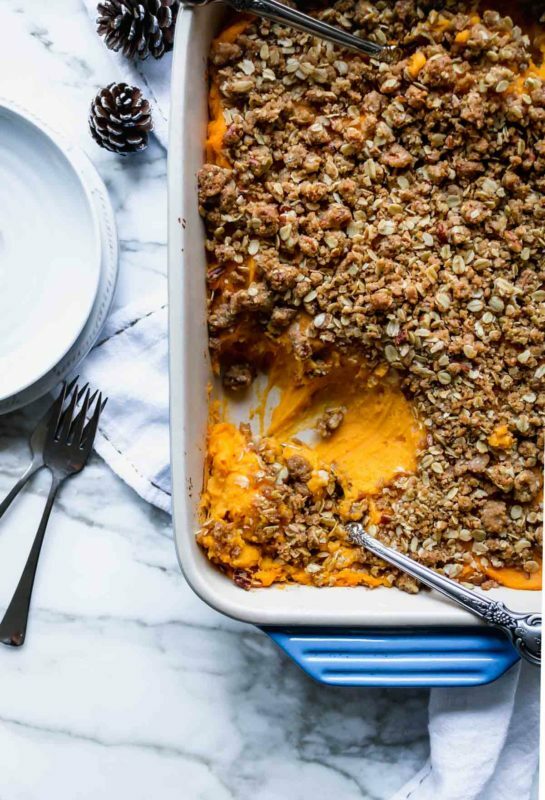 My usual mashed and puréed sweet potatoes are topped with a simple brown sugar pecan oat crumble, and baked until golden and crisp on top. 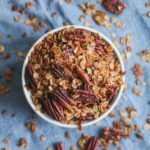 The crunch of the pecans and the oats contrast beautifully with the smooth sweet potatoes. This is what Thanksgiving dreams are made of for me. I’m going to be serving it next week when we will host both my parents and Brian’s parents and sister for the first time. Sharing great food together with love is what it’s all about – even if you didn’t realize certain foods were great for the first half of your life. I’m making up for lost time! Preheat your oven to 375 degrees F. Generously grease a 9×13 inch pan or approximately 3-quart baking dish, and set aside. Peel the sweet potatoes and chop into 1 1/2 inch cubes. Place cubed sweet potatoes in a large pot and cover with cold water. Add a generous dash of salt and bring to a boil over medium-high heat. Boil potatoes, stirring occasionally, for 10-15 minutes, until soft enough to be easily pierced by a fork. Reserve about ½ cup of the potato water, then drain potatoes and return them to the pot. Add butter, maple syrup, heavy cream, a small splash of the reserved potato water, and salt. Using an immersion blender, blend the potatoes until completely smooth – it takes a few minutes. If you don’t have an immersion blender, use a hand mixer, but the immersion blender creates a wonderfully silky texture. If potatoes seem too thick, add a little more potato water and blend again. Taste potatoes and add further salt or maple syrup to taste. Spread potatoes in an even layer in the baking dish. For the crumble, melt the butter in a large microwave-safe bowl. Whisk in the brown sugar, cinnamon, nutmeg, and salt until combined. Stir in the flour, oats, and pecans until evenly distributed. I actually use my hands at this point to ensure the mixture is thoroughly combined. Sprinkle the crumble mixture evenly over the potatoes. 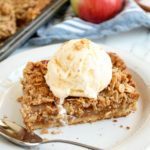 Bake for 25-30 minutes, until crumble is golden brown and smelling toasty. 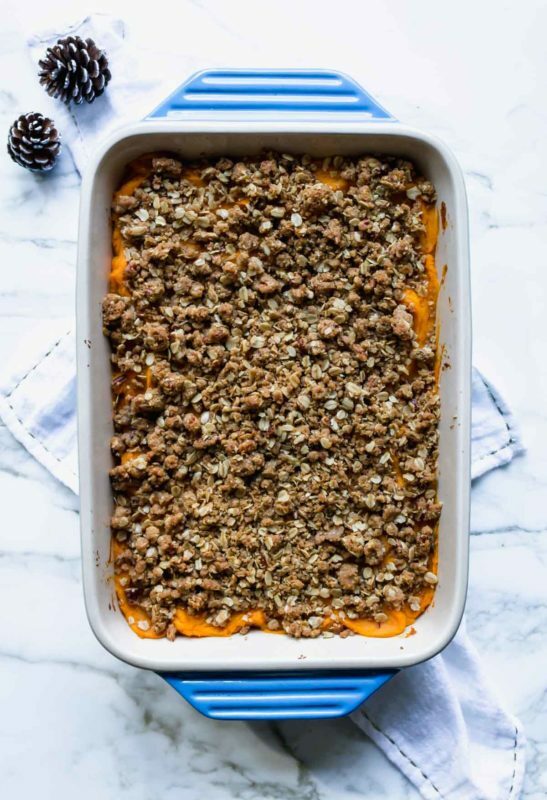 This sweet potato casserole can be prepared ahead of time (yay!). Make the potatoes through step 5 and spread in the baking dish, then cover and refrigerate overnight. You can also make the crumble ahead and keep it in the fridge overnight, separate from the potatoes. When ready to bake, proceed from step 7 and add a couple minutes to the baking time. Casserole will keep, well-wrapped in the refrigerator, for up to 5 days. PS – you can also find this recipe in Imperfect Produce’s All Sides Welcome – a free Thanksgiving sides e-cookbook! I’m honored to be featured along with several talented bloggers. Hi Katy! Just want to let you know that I made your casserole for our Christmas dinner yesterday and my family loved it! All the ladies want the recipe. Thank you for sharing. Oh my gosh, thank you so much Julie! I am so glad it was part of your celebration. Merry Christmas! !